Ross Rebagliati was the first person EVER to win an Olympic gold medal for Men’s Snowboarding at the 1998 Winter Olympics in Nagano, Japan. I had the opportunity to chat with Ross about his CRAZY Olympic story, learn about his marijuana startup and get his secret edible recipe. 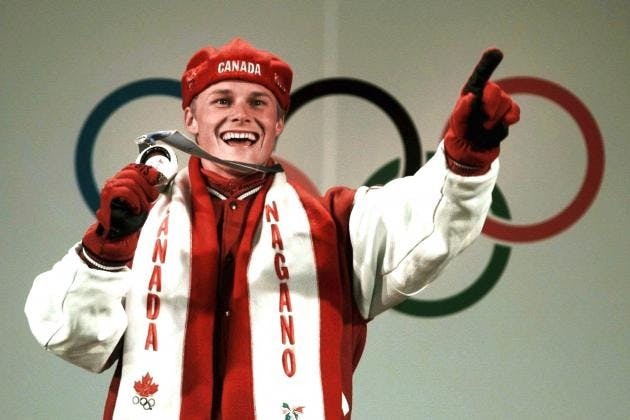 Ross Rebagliati was the first person EVER to win an Olympic gold medal for Men’s Snowboarding at the 1998 Winter Olympics in Nagano, Japan. I had the opportunity to chat with Ross about his CRAZY Olympic story, learn about his marijuana startup and get his secret edible recipe. HINT: After winning the gold, he was found to have Tetrahydrocannabinol (or THC) in his system. He was automatically disqualified. “I was born and raised in Vancouver and started competing in ‘88, so it was essentially 10 years preparation for me to reach the 1998 Nagano Olympics. I was used to competing at a senior level, but the Olympics are a different ballgame. An untold amount of preparation goes in; I was in the gym 3 hours a day, 6 days a week, lifting weights, cycling to stay in shape; we were on snow 200 days a year just training. It’s an unbelievable amount of time and sacrifice. You have no social life other than the people around the snowboarding scene. You can watch Ross’ Olympic run and gold medal ceremony below. Tell us your first-hand Olympic story. “Words cannot describe the sense of accomplishment when I actually won gold. The fact it’s all over is a relief. I had won, FINALLY WON, and it was all worth it. To have the recognition that my peers respected me as an athlete also began to hit home. That said, nothing is how you’d expect it. It took a while to sink in. It was the next morning, we had the award ceremony and all the guys had finished their events. It was at this point that a few of us were in my room. A coach came in and told everyone to leave and that I needed to sit down. It was obvious something was up; I figured that it had to be something to do with the drug test given the timing of it all. I didn’t know exactly what it was, but I gathered all my supplements just in case I was inadvertently taking something on the list of banned substances. I told my coach very early on that the only thing I could think of was that I showed positive for marijuana; it was the only thing I had been exposed to leading up to the Olympics. It was then discussed, “Ok, it won’t be the biggest problem in the world’ – I wouldn’t be the only athlete to test positive for cannabis and still retain the medal. There have been cases in the past where it’s all worked out. THC (the active component in cannabis) wasn’t on the banned substance list. This then begs the question: Why even take the medal way from me? It must have been embarrassing for the IOC to try to strip me of my medal for testing positive for a substance that wasn’t actually banned. For me, now, it’s frustrating as my athletic accomplishments were – and are – overshadowed by what preceded. I became infamous for the wrong reasons. We had stayed away from it [marijuana] – on the world circuit. THC was banned, so we just assumed, and we didn’t question the IOC. We simply stayed away from all substances. Snowboarders are kind of a big family, so we don’t tend to want to enhance ourselves to outdo a fellow competitor. There were a lot of parties. There was a wake on the lead up to the Olympics for a friend, who was buried in an avalanche, and there was a lot of marijuana consumed around at this tragic event, but I hadn’t been smoking it myself at that time. I wasn’t consuming marijuana, but I also didn’t think I’d have to change my environment or alienate myself from my friends; I just wouldn’t use marijuana, it’s that simple really. When I returned home from the Olympics, there was an almost social revolution on the back of it. Canadians were very accepting of cannabis, so I received so much support. I came home to a hero’s welcome. The Prime Minister of Canada called me after I got my medal reinstated. He said that the country supported me and that I had handled myself really well. I had spent a night in a Japanese jail, so as you can imagine, when I was celebrated in such a way, well, that meant a lot to me. How did you come up with the idea for Ross’ Gold? “It became apparent that culture had changed. People were open to sensible discussion on marijuana, and were ready to actually explore the benefits. I’m not sure if it’s more or less of a controversial issue now. It’s certainly a lot more mainstream. As we all know, Colorado and Washington have fully legalized, so things have certainly come on culturally. I’ve also become the go-to guy in media circles when cannabis and athletics become intertwined. Mild furor inevitably follows when an athlete is found with cannabis in their system, but times are certainly changing. I’m often asked about the fact that supreme athletes such as Michael Phelps and Usain Bolt have admitted regular cannabis use, so what potential benefits could there be in sports? I always answer this question the same way; Cannabis is the best jet lag cure, it makes for quick recovery from frequent long-haul travel with different time zones. It keeps appetite healthy for maximum fuel intake to sustain high output over the season. Often appetite is lost due to jet lag and the different eating and sleeping cycles. CBD is potentially one of the most powerful anti-inflammatory substances we know of. It’s perfect for after workouts, post injury, post-operation and general aches and pains from long-term athletics, training, competing, or simply living life to its fullest. CBD is also incredible for anti-stress and anti-anxiety. Cannabis is excellent for getting quality sleep, which in turn has several key benefits: Mental strength and muscle growth/recovery to name just a few, these are all key elements for any athlete. Cannabis is fat-free, has zero calories, gets you to bed early and up early in the morning feeling fresh and ready to go. No alcohol hangover! It doesn’t impair your judgment like other substances, and it does not impair your physical ability. It is the safest drug known in that there has never been a death ever associated to it. Early indication shows it could reduce some brain injuries due to concussions. It’s a responsible alternative to alcohol/tobacco use and is not physically addictive. Fast forward to 2013, I was watching the evening news when I saw a story that got my full attention. The news was reporting that Colorado and Washington states had legalized cannabis. Canada quickly decided to follow a similar path, amending their current laws revolving around medical cannabis. I realized this was it, the card I was dealt in 1998 was finally ready to be laid back on the table. If I couldn’t shake the stigma that was put upon me, why not embrace it and use it to my advantage. In January 2013 I launched Ross’ Gold along side my business partner Patrick Smyth. Over the course of the year, the Ross’ Gold team would tweak the business model, focus the direction of the company and amend the original focus of storefront dispensaries to an online system of ordering cannabis, as per Health Canada regulations. With the development of the company, many things changed, but one thing stayed consistent, the name Ross’ Gold. 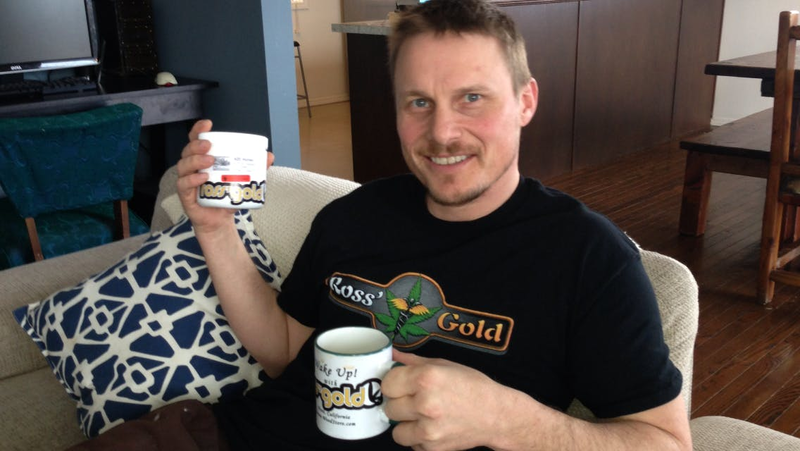 We [Ross’ Gold] have partnered with producers across Canada who will be supplying our distribution center with product. We will fill prescriptions and have next day delivery via bonded currier from our distribution center. In addition to this we will be offering our patients actual medical clinics where they can see our accredited physicians (doctor or nurse practitioner) for professional advice, recommendations and potentially a prescription. Four categories (Ross’Platinum, Gold, Silver and Bronze) will be used to categorize our strains based on THC and CBD ratios. Platinum will have the highest THC levels (+20%) and Bronze will have virtually no THC but rich in CBD (used for anxiety and epilepsy among many other things). What is your favorite edible recipe? My favorite edible recipe is a very simple five-step process. Step 1 – Make yourself a nice hot cup of coffee. Step 3 – Add coffee cream to taste. Step 4 – Stir and enjoy. Step 5 – Repeat the last four steps over the course of the morning until the desired state of body and mind are realized. What do you think of Ross’ story? Let us know in the comments below.